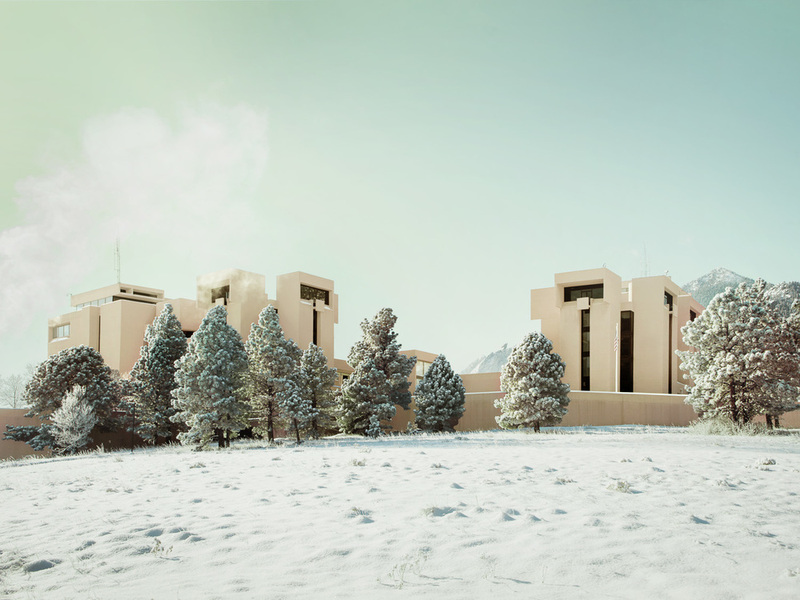 The Mesa Laboratory, also known as the National Center for Atmospheric Research sits at the base of the flatirons in South Boulder. I remember seeing it for the first time as a college freshman, then in Woody Allen's Sleeper, and was struck by its clean, otherworldly lines and its unbelievable perch, looking down and east over a sea of midwestern flatness. The building was designed by I.M. Pei in 1961, and built in 1964, so 2014 marks NCAR's 50th birthday. Pei based his design on the Anasazi cliff dwellings of Mesa Verde, and used bush-hammered concrete and locally sourced aggregate to help the structure blend with its environment. I wanted to capture the abstract, conceptual nature of the architecture, in a way that recognizes the project's age, and its significance as a landmark in modernism.